Gravity flow modules work best for multiple-item orders, when average supply holding time is minimal, and when item weight is important. First-in, first-out (FIFO) storage gives you automatic inventory rotation. 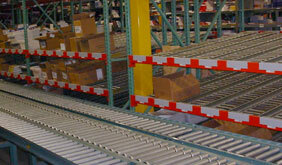 Whether you need a bay or two of flow storage or a long row of gravity-driven pick faces with pallet storage above, utilizing rack-mounted flow storage gives you the flexibility to change and reconfigure.